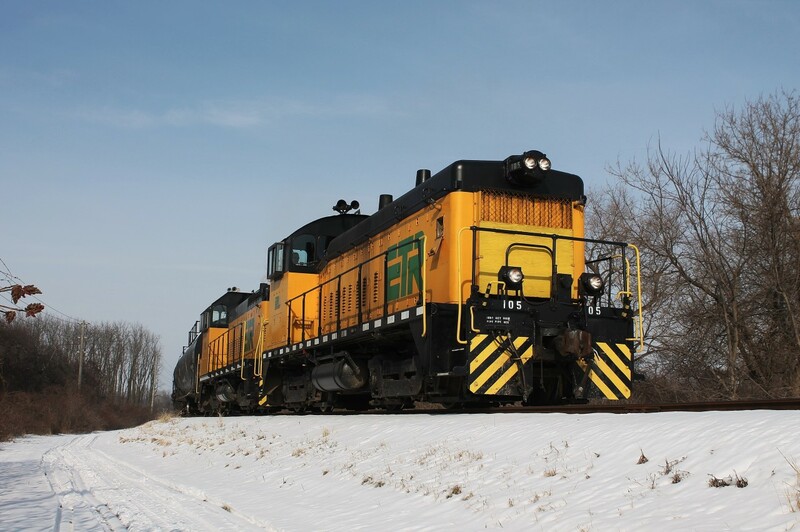 Railpictures.ca - Mike Molnar Photo: A surprise run down to Amherstburg, ON. by ETR yesterday caught me off guard. I was very unprepared for a chase (I needed to get gas first) and I was unfamiliar with the roads in the area for shooting. But, with a little help from Google I was able to get a few shots of them running south of Ojibway Yard which happens infrequently. ETR only has one customer left in Amherstburg which doesn’t need daily service so they only head down once or twice a week. This train ended up being an extra job taking empty LPG tanks for storage. There is a yard in Amherstburg called Texas Yard that used to service a few businesses. Hearn Group, General Chemical/Honeywell, a rock quarry?, and Crown Royal/Diageo all used to receive rail service with only Crown Royal/Diageo still online. So to make use of the rails here ETR uses all the yard tracks and spurs that are still intact for storing LPG tank cars. These are also the most southern rails in Canada still in service. In this shot they are taking a cut of tank cars to the old Honeywell spur from Texas Yard. | Railpictures.ca – Canadian Railway Photography – photographie ferroviaire Canadienne. Caption: A surprise run down to Amherstburg, ON. by ETR yesterday caught me off guard. I was very unprepared for a chase (I needed to get gas first) and I was unfamiliar with the roads in the area for shooting. But, with a little help from Google I was able to get a few shots of them running south of Ojibway Yard which happens infrequently. ETR only has one customer left in Amherstburg which doesn't need daily service so they only head down once or twice a week. This train ended up being an extra job taking empty LPG tanks for storage. There is a yard in Amherstburg called Texas Yard that used to service a few businesses. Hearn Group, General Chemical/Honeywell, a rock quarry?, and Crown Royal/Diageo all used to receive rail service with only Crown Royal/Diageo still online. So to make use of the rails here ETR uses all the yard tracks and spurs that are still intact for storing LPG tank cars. These are also the most southern rails in Canada still in service. In this shot they are taking a cut of tank cars to the old Honeywell spur from Texas Yard. Thanks Myles. Fascinating stuff. Appreciate the info! There’s currently three locomotives at Hearn’s in Amherstburg: #200 (Alco S1, former ETR 101), #300 (Alco S3, former ETR 103) and #317 (Alco S3, former Arkansas & Midland 317). They were used there until 2008 to shove hoppers up a very steep incline for unloading, there’s also a CP coach on the property. Nexen Chemical also had a plant in Amherstburg until it closed in 2006. @jknott86 This was way before my time but I believe they were plant switchers at Hearn’s plant in Windsor off Seminole and Walker. I know for sure one is ex ETR. There’s a video of one of them running back and forth on their spur in Amherstburg there on YouTube. The spur is cut off from ETR now (not shown on Google Maps). I have no idea if they’re still operable. Thanks! I was long overdue finding a train running to A’burg. Interesting. Can’t say I’ve ever looked into this one much. Checking it out a bit on the old satellite view now – there appears to be a few locomotives at Don Hearn & Sons in town there. Anyone know the story on those? Impressive image!!! Certainly worth taking the time out to follow.